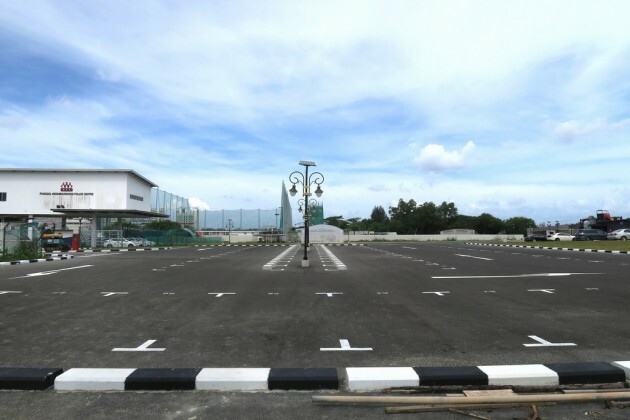 Many see Punggol as a place only for prawning or cycling. 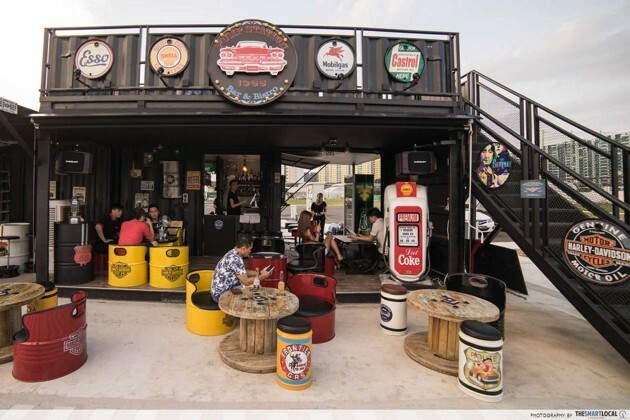 But with the inception of its new cluster of “cargo container bistros” - which mirror Bangkok’s famous Artbox concept - there’s now a fresh place for your gatherings with friends or date with bae. 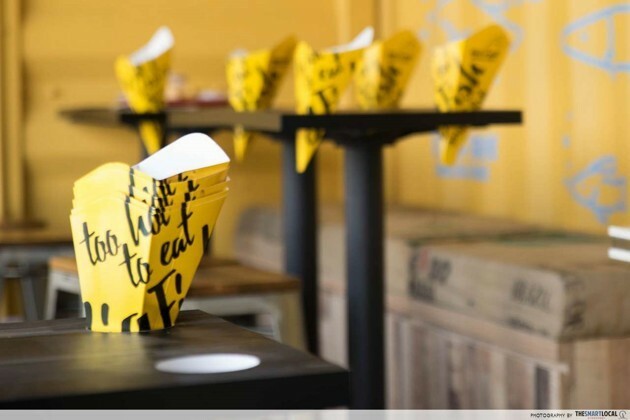 Located just 5 minutes away from Riviera LRT, the 7 eateries at Tebing Lane can satiate anything from your truffle fries addiction to bingsu cravings. It doesn’t matter if everyone in your group wishes to eat something different - you can always purchase a variety of food from the different eateries, before enjoying it together at the spacious alfresco seating area. Big Fish Small Fish was bustling with activity when we visited. Place your order on the e-kiosk and anticipate some good grub. Unlike the usual Fish and Chips that comes with French fries, the one here is served with thin salted potato crisps. Pick from a wide selection ranging from the cheapest option of Dory ($6.90) to the priciest Fresh Red Snapper ($15.90). Besides the fish-tastic mains, there are also unique desserts such as Ondeh Churros ($6.50). We went for the Dory after reading favourable reviews online, and it did not disappoint. A free-flow of sauces is available right next to the collection counter. 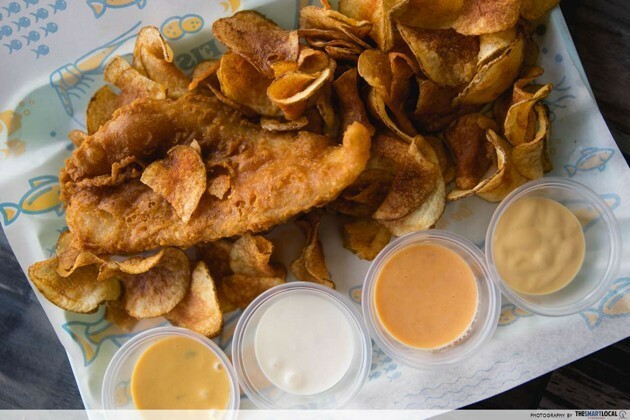 Drizzle either the Cheese, Tartar, Salted Egg or XO Mayo sauce over your fish and dig in. The viscous sauce coated the fish well, with our favourite being the XO Mayo - a sweet-spicy combination that packs a punch. It’s difficult to find decent Fish and Chips in Singapore for under $10, but this was certainly bang for our buck. Modelled after a gas station, bar-restaurant Pump Station has metal barrels as furniture. 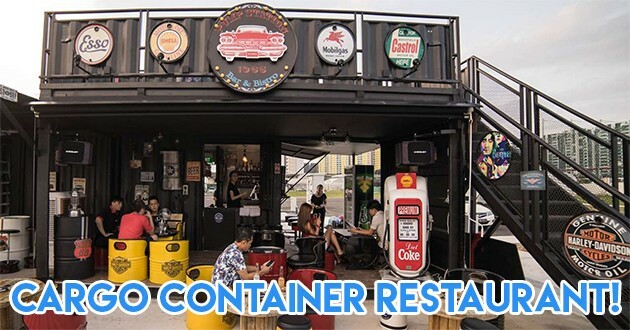 It is the only stall among the 7 with a second storey atop the container itself, allowing patrons to dine with the best view. 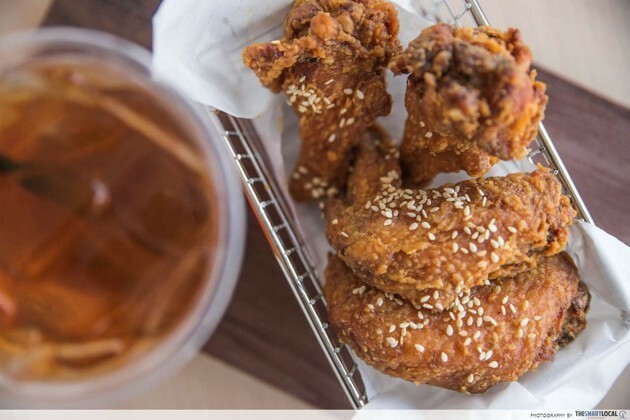 Try their best-selling Pump Chicken Wings ($12.90) and Japanese Soya and Sesame Wings ($12.90) if you’re craving some savoury finger food. 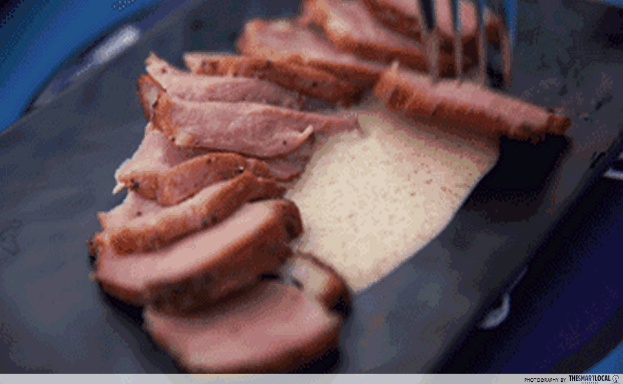 Another dish you won’t regret trying is the Kamo Kosho Smoked Duck with Pepper and Sesame Sauce ($7.90). We waited pretty long for the food to arrive, but the mouth-watering dish was a satisfying reward. It’s a little pricey for something of only a snack-sized portion, but the peppery meat and sweet-savoury dip was a delectable combination. Seoul Good Dessert and Coffee specialises in fried chicken and bingsu. Their ingredients are all imported from Korea for authenticity, and everything is prepared upon order to ensure ultimate freshness. We went for the 4pc Special Chicken Wings with Iced Tea set, which was going at a discounted price of $7.90 as part of their opening promotions. The promotion period is unconfirmed, so summon your kiasu instincts and make your way down quick before prices spike. Each chunk of meat was thoroughly marinated, and the soy flavour of the sauce had just the right amount of saltiness. However, the portion’s pretty small - even for the 6-piece set - so this is best enjoyed as a snack. No Korean feast is complete without everyone’s favourite Korean dessert - so wash those wings down with Seoul Good’s selection of refreshing Bingsu. Prices range from $14.90 to $19.90 for generous servings of frozen delight which can easily feed 2-3 people. D’Grill reminded me of a tze char store at first glance, and I was partly right. Besides the usual tze char fare like sambal fish, they also serve up unique fusion dishes - such as Hot Plate Pasta (from $12.90) - for those who are feeling more adventurous. Specialising in seafood, most of their dishes are done hotplate- and BBQ-style. We opted for the Grilled Hot Plate Sambal Stingray ($13) and Secret Garden Chendol ($6.80). 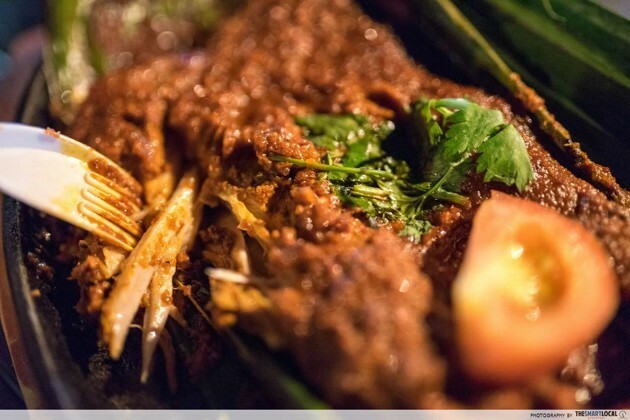 Even before the stingray dish reached our table, I could already smell the fragrant sambal. Taste-wise, the meat was kinda tough, but the flavourful sambal slathered on top compensated for it. All in all, this was a value-for-money dish with a serving size good for two at least. 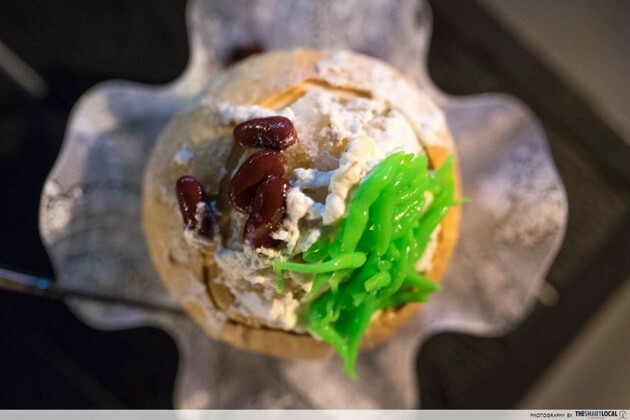 Plus-points for the presentation of the Chendol - encased in a coconut husk, this scrumptious thirst-quencher was topped with a good amount of jelly and red beans, and ended our meal on a sweet note. 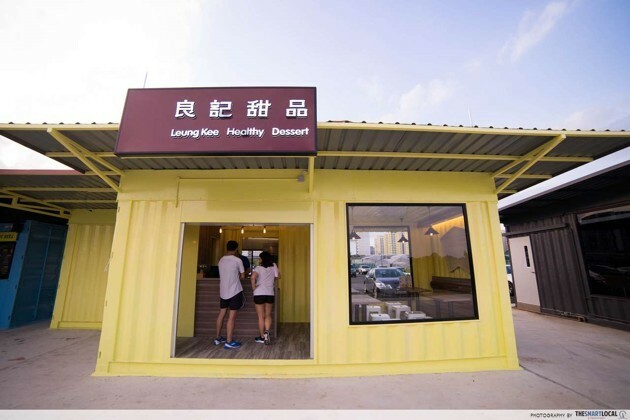 The 16-seater container housing Leung Kee Healthy Dessert has a simple, old-school layout which stands out from the edgier designs of the other stalls. Choose from both hot and cold desserts, most of which are fruit-based. For some reason, the names of the items on the menu are in Chinese characters. 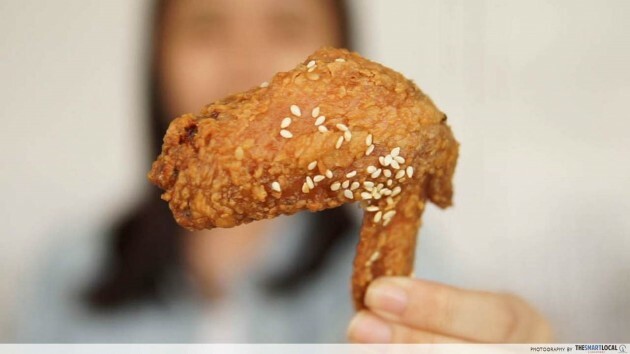 However, their descriptions are in English, so non-Chinese friends can still order without difficulty. Needing respite from the afternoon sun, we went for their popular Durian Sherbet ($7.30). The generous portion was topped with syrup-filled pearls, aloe vera, and a chunk of durian flesh. Our only complaint is that the dessert melts too quickly - so tuck in fast while it is still in its frozen glory. 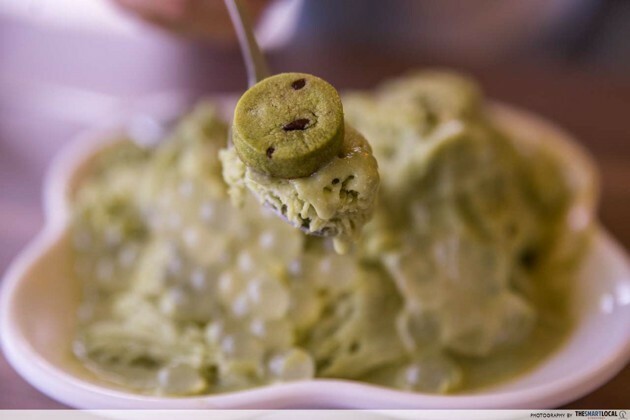 Matcha lovers will definitely enjoy the Matcha Sherbet ($6.30). Matcha cookies adorn the mountain of creamy goodness, and the taste of green tea is strong in every bite. 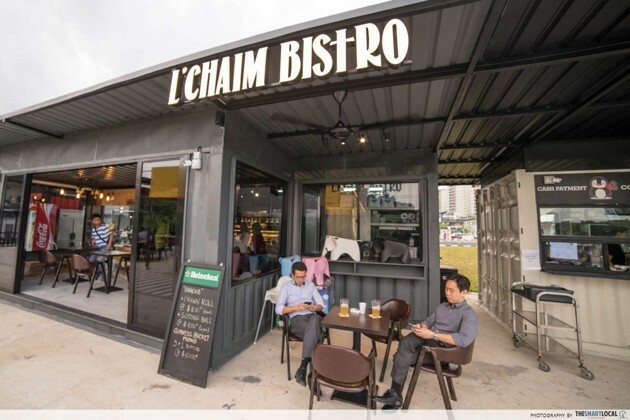 Growling tummies won't find much satisfaction at L'Chaim Bistro - focusing heavily on alcoholic drinks, with only prawn rolls and sotong balls as finger food, it's more of a bar than a bistro. Nonetheless, the ambience is laid-back and the staff are approachable, so give them a shot the next time you’re trying to decide on a new hangout with your drinking kakis. We’re hoping that they’ll add more food options to their menu in time to come! When we headed down, Boost @ Banks had not commenced operations yet. But we managed to speak to a staff member, who shared that they specialise in alcoholic beverages and soft drinks. 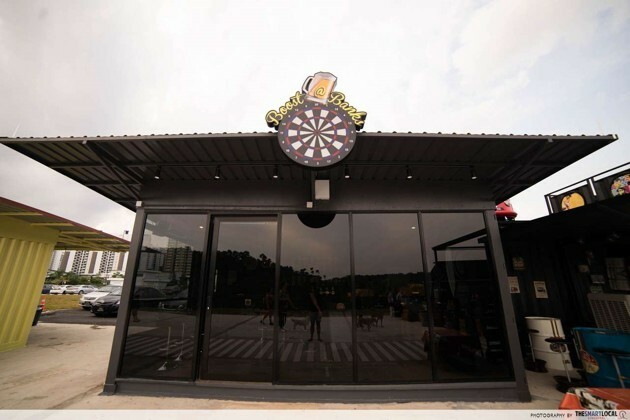 Electronic dart boards also take centrestage, guaranteeing a chill night out with your bros after your session of pool and prawning nearby. 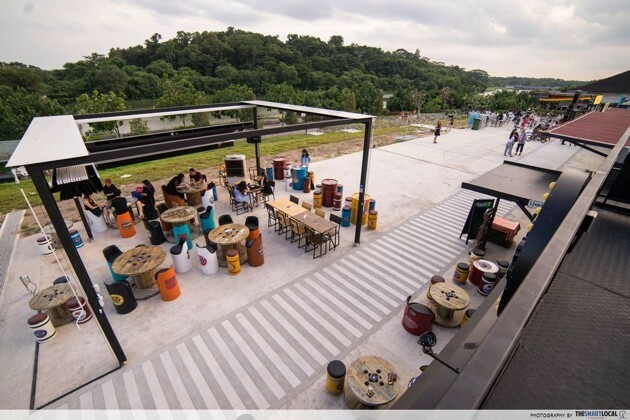 If the word “ulu” is synonymous with Punggol for you, these 7 stalls will make the travel time worth it. Trawl through the line-up of delicacies and fill your belly to the brim, ending your food fest with a chill session at one of the bars. You can even take a relaxing stroll along the reservoir to walk off that food coma afterwards. 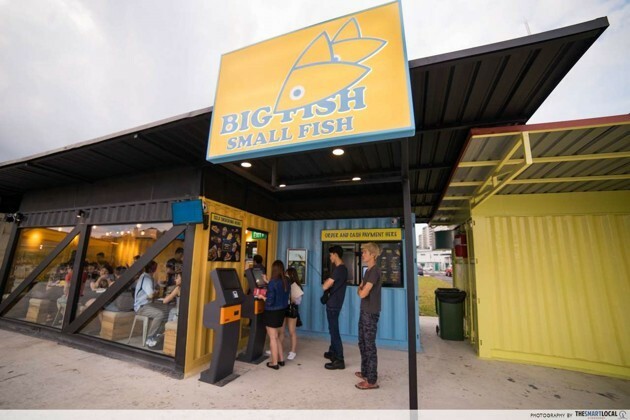 As of now, most of the outlets are new establishments, so opening hours might be shaky and waiting times are long - we waited approximately 40 - 50 minutes at a couple of stalls for our food to arrive. But it is still an interesting place to explore and a wonderful opportunity to give local start-ups a chance. Note: Indoor seats are limited, so check the weather forecast before you decide to head down!